Use the Restore Family button in a family's Lead File record to move them from the Lead File back to your main Jackrabbit database. Families must be restored to your main database individually. There is no option to mass restore Lead Files back to the main Jackrabbit database. If the family to be restored had more than one student when they were archived from your main database, there will be multiple Lead File records for the family. 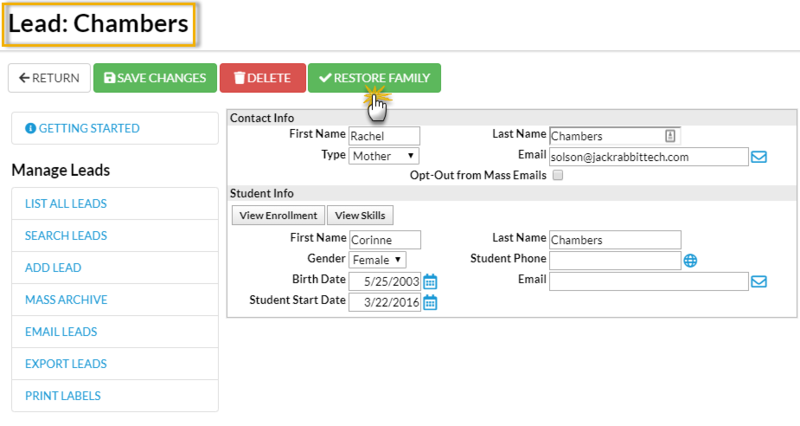 Use the Restore Family button in any of the family's records to restore ALL students in the family back to one Family record in your main database.